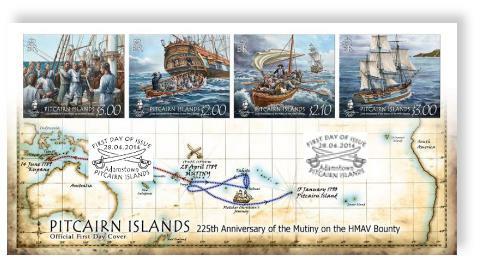 The HMAV Bounty left Tahiti on April 4th 1789 and headed for the Tongan Islands. Time on the idyllic island had made the crew soft, forcing Bligh to order brutal floggings to bring them into line. Severely discontented, eighteen members of the crew, led by Christian, conspired to mutiny. On April 28th they entered Bligh’s cabin, awakened him and pushed him on deck wearing only his nightshirt. Eighteen of the loyal crew were put into the Bounty’s open boat with Bligh. In what is regarded as a remarkable feat of seamanship and navigation, Bligh navigated the overcrowded 23-foot (7M) open boat on an epic forty-seven day, 3,618 nautical mile (6,701 km) voyage to Timor, equipped only with a sextant and a pocket watch (without charts or compass). He then returned to Britain and reported the mutiny to the Admiralty on 15 March 1790, 2 years and 11 weeks after his original departure. Meanwhile, the mutineers returned to Tahiti to avoid detection, but feeling unsafe, they made an unsuccessful attempt at settling in Tubuai, before returning to Tahiti yet again and put some crew ashore. Finally Christian, eight other crewmen, six Polynesian men and twelve women, one with a baby, set sail hoping to elude the Royal Navy. The mutineers went in search of Pitcairn Island, which they knew had been misplaced on Royal Navy charts and upon discovery in January 1790, they then took ashore the stores and burned and sank the Bounty, in Bounty Bay. To this day remnants of her timbers, nails and ballast stones are still visible in the waters of the Bay.